All text and photographs Copyright © Phil Jeffrey 2001-2009 unless explicitly stated otherwise. 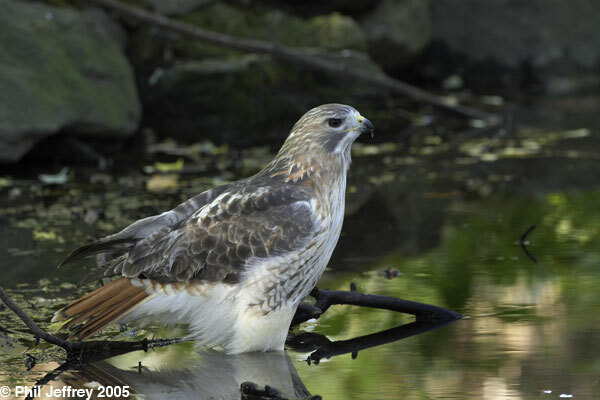 Pale Male is probably the single most famous Red-tailed Hawk in history, and a living example of adaptation to urban environments. While most raptors are wary of mankind (and with good reason given their historical and current persecution), Red-tailed Hawks have colonized many urban areas within the USA. Manhattan is no different in this regard, so it's natural that Central Park attracts Red-tailed Hawks to it's plentiful supply of Rock Pigeons and squirrels. Peregrine Falcons and American Kestrels also nest in Manhattan in several locations on buildings and on some of the East River bridges (e.g. Brooklyn Bridge and the 55 Water St Peregrines), but their existence is much less obvious to the general public. The NYC Parks Department are also trying to reintroduce Bald Eagles into Inwood Park in northern Manhattan, a quest that seems doomed to failure: Bald Eagles are not as tolerant of humans as Red-tailed Hawks so the prospect of a successful nest is near zero even though there's often a large congregation of Bald Eagles a little further up the Hudson at Croton Point each winter. Pale Male, in contrast, eventually chose to nest in one of the most prominent of all possible locations - above a balcony of 927 5th Ave overlooking the east side of the park just north of the E72nd Street entrance. Ironically the spikes installed above the window to deter pigeons turned out to be exactly the sort of structure needed to secure a Red-tailed Hawk nest made of twigs. The nest is very visible from the park, with the traditional vantage point being on the west side of the Conservatory Water (model sailboat pond), and the nesting activities have over the years attracted an ever-increasing series of onlookers from the start of the nesting season (January) until fledging (end of May). The visibility of this nest (and Marie Winn's book) has made Pale Male into a mini-celebrity. There's a Pale Male movie, Marie Winn's book Red-tails in Love, and at least one dedicated website. Living below an active Red-tailed Hawk nest is probably not the most pleasant of experiences, especially galling if you live in an apartment whose valuation might not be far from $100 million. That might have something to do with the decision of the building's co-op board to remove the nest on the 7th of December 2004. The nest removal gave rise to a great deal of controversy, provoking demonstrations outside the building, outcry from a organizations including NYC Audubon, and at least one of the Pale Male fan club losing their sense of perspective (although the charges were subsequently dropped). Birders far and wide within the USA were monitoring the progress of that story - at one point a brief personal survey of the regional birding email lists showed that birders from many states were very upset at the nest removal. At the end of December 2004 the co-op board at 927 5th Avenue relented, and replaced the nest supporting structure and the nest was rebuilt by the Red-tailed Hawk pair. Pale Male and Lola's nesting attempt was unsuccessful in 2005. While this might be due to various factors, and Pale Male has not always nested successfully, the most obvious one is the nest site disruption. The 2004 nesting season was successful, in contrast. While the iconic Red-tailed pair were having a hard time, a pair with a male presumed to be one of the immatures from previous years ("Pale Male Jr.") was successfully breeding at the southern end of the park on the Trump Parc building despite nesting rather later than is typical for this species. The young hawks hatched in June and fledged at the end of July 2005 (this is about 2 months later than the typical schedule for Pale Male). There's also a pair that can be habitually found in the East 100's around Mt. Sinai Hospital, and I've also seen attempted nesting in the West 80's on Central Park West, but so far Pale Male and Pale Male Jr's are the only two nests that have successfully fledged. Given that Central Park isn't infinitely large, it is remarkable that so many Red-tailed Hawks coexist within a relatively confined space, one that is substantially smaller than their expected territory in the wild. CBS News story from July 2003. Audubon magazine article on the nest eviction. PBS page on Red-tails in love. Gothamist article on the nest eviction. Do your own Google search for Pale Male sites - there are many more. 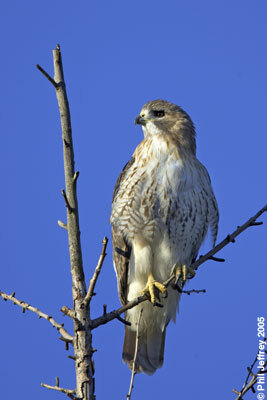 Virginia Beach Red-tailed Hawk article. Red-tailed Hawks in Glen Canyon Park (San Francisco). Tucson Audubon's Raptor Nest Sites in Urban Areas.